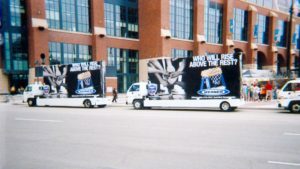 As the largest advertising market in the Midwest, Chicago and the “Chicagoland” area is a great market for your next mobile billboard and glass display truck advertising promotion. Advertising with Billboards ‘N’ Motion will give you the opportunity to target residents of the Chicago and “Chicagoland” area, in addition to the many visitors and tourists to the area, right where you know they will be! Contact Us so that we can help you plan your next Chicago Mobile Billboard or Glass Truck Display Advertising campaign!